The development of the strategic plan for your warehousing, distribution and manufacturing center can determine how successful your business is in the coming years. Whether you’re in automotive supply, fabrication and assembly, consumer goods, the chemical or petroleum fields or any industry in between, the decision of how to streamline your business cannot be left to chance. 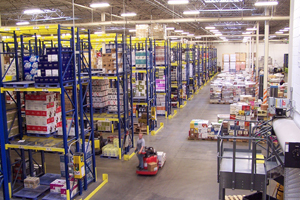 The right warehouse design layout is the first step to an efficient business. Our engineers have experience across a wide range of vertical markets, allowing us to bring specific expertise to bear on each project. Our combined knowledge and experience provides the support necessary for the complete integration and implementation of your warehouse design layout, distribution procedures, and manufacturing systems, no matter what industry you are in. The systems we create are customized for your specific needs, to reduce operating expenses and increase your bottom line. Trommer & Associates, Inc. works for you. We listen to your needs, then develop a sound warehouse design layout and material handling solution designed to meet those needs both immediately and in the future. Our proven methodology has repeatedly produced the solutions that successful companies demand. Trust Trommer & Associates, Inc., with all of your warehouse design layout and supply chain needs. We make it possible for you to focus on running your business, while we take care of the details!